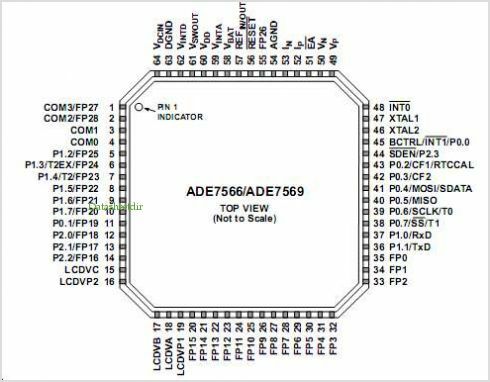 The ADE7116 ADE7156/ADE7166/ADE7169/ADE7566/ ADE75691 integrate the Analog Devices, Inc., energy (ADE) metering IC Analog front end and fixed function DSP solution with an enhanced 8052 MCU core, an RTC an LCD Driver and all the peripherals to make an electronic energy meter with an LCD Display in a single part. The ADE measurement core includes active, reactive, and apparent energy calculations, as well as voltage and current rms measure- ments. This information is accessible for energy billing by using the built-in energy scalars. 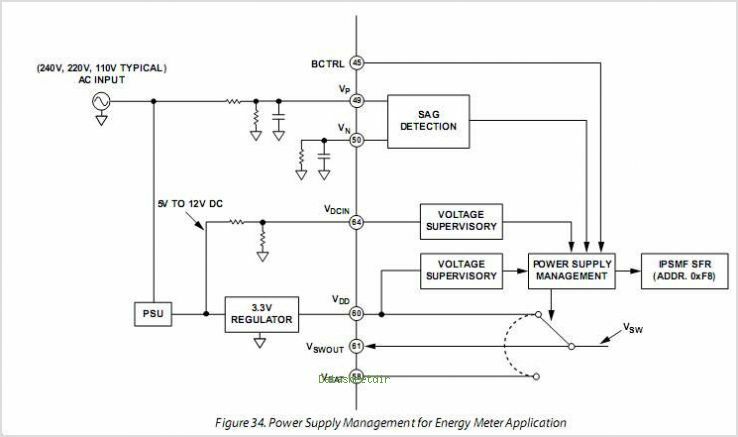 Many power line supervisory features such as SAG, peak, and zero crossing are included in the energy measurement DSP to simplify energy meter design. By Analog Devices, Inc. This is one package pinout of ADE7116,If you need more pinouts please download ADE7116's pdf datasheet. This is one application circuit of ADE7116,If you need more circuits,please download ADE7116's pdf datasheet.